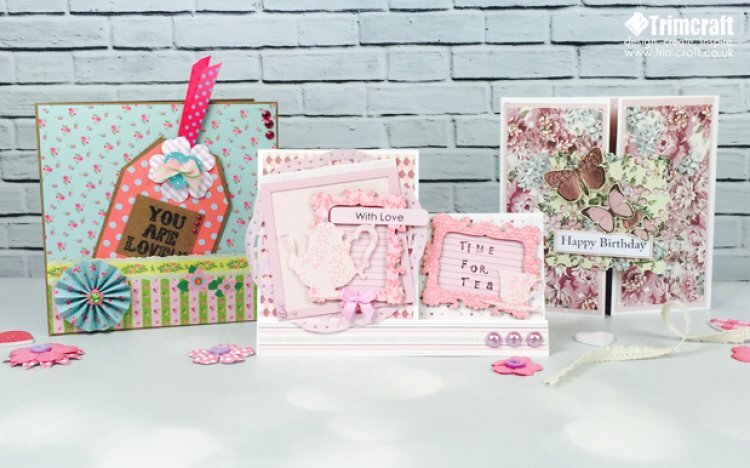 These cards are perfect for young girls, teenagers or adults alike and we have so many pretty collections to create your cards with your will be spoilt for choice. 1.Cut a piece of backing paper 15cm x 15cm and adhere to the card blank. 2.Cut a strip from one of the mixed collage backing papers and adhere to the bottom of the card to make a small pocket. 3.Cut a tag shape, cover with backing paper and decorate with ribbon, blossoms, heart buttons and mini bows, stamp the You are Lovely sentiment onto Kraft card, cut out and stick on the tag. 4.Add an accordion sticker to the corner and some gems to finish. 1.Cut two 7cm x 14.5cm strips of paper; adhere to each side of the card front. Mat and layer with two 6.5 x 14cm strips and adhere to the front of the card. 2.Die cut the nesting stamp adhere to the left side of the card, using foam pads. Top Tip - Measure the centre of the square to make sure you do not stick foam pads too far over. 3.Cut out some of the butterflies and adhere to the nesting stamp die cut. 4.Stamp the sentiment, cut out and mat and layer onto some decorative paper. Top Tip - Pick a piece that is not too decorative so that you can write on it. 6.Cut two 7cm x 14.5 cm strip to adhere to each side of the inside of the card to finish. 1.Take the 5x7 card blank, score at 10cm down to 2cm away from the bottom edge. 2.On the small side score at 2cm to the score line and 4cm to the score line. Cut along the first score line. Fold the two vertical score lines mountain and valley fold. This creates your stepper card. 3.Cut a piece of backing paper 9.5 x 10cm adhere to the large side of the card. 4.Cut a 7.5cm square of backing paper to adhere to the small side. 5.Cut a strip of backing paper to fit along the bottom of the card. 6.Adhere a doily to the large side. 7.Add backing paper to the back of the frame and adhere to the card front. 8.Take a smaller frame, add backing paper and adhere to the first frame. Add a bow sentiment and die cut teapot. 9.Repeat the frame again but stamp the backing paper with the sentiment ‘Time for Tea’ adhere to the smaller section of card and finish with a die cut tea cup, then some gems to finish. We would love to see your recent cards for girls! Just share and upload them to the project gallery.